Contact Daniel Buckley at dbtucson@gmail.com to have information added to the blog.Find us on Facebook by clicking here. Deutsche Grammophon has enjoyed a long and particularly fruitful relationship with the composer & conductor Pierre Boulez. He continues to compose music, but DG has chosen to take this opportunity and release a collection of his complete works, as they are now. This set will be released on July 23 in the US. The creation of this set was completely carried out under the composer’s supervision, including the choice of recordings. Many works have multiple recordings, including on other labels, and only Boulez’s personal choices have been included. In addition to DG recordings this set includes selections from Sony, Harmonia Mundi, Erato and others. As a result of pulling from many sources, this set is able to include many world-class performances by such artists and ensembles as Pierre-Laurent Aimard, BBC Symphony Orchestra, Ensemble Intercontemporain, Christine Schäfer, Maurizio Pollini and many others. In order for the set to be complete, some works had to be newly recorded and others are being published for the first time. 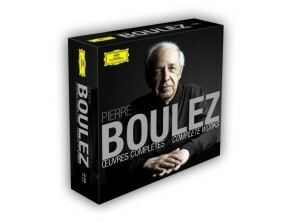 In addition, the booklet includes a new and extensive interview with Boulez covering his compositional career. The booklet lists the works in alphabetical order for easy browsing and includes extensive notes on each work and recording. Taken together with a new timeline of Boulez’s life and career, this set is the definitive celebration of Pierre Boulez’s compositional career thus far. ~ by Daniel Buckley on July 8, 2013.